Having a heart attack felt nothing like I thought it would feel. For one thing, unlike sudden cardiac arrrest, in which the heart stops beating and you stop breathing, during my heart attack (myocardial infarction), my heart continued beating, and I was conscious throughout despite horrific symptoms – so how could I possibly be having a heart attack? Like most women I know, I thought very little about heart disease, even though it is our #1 killer each year. 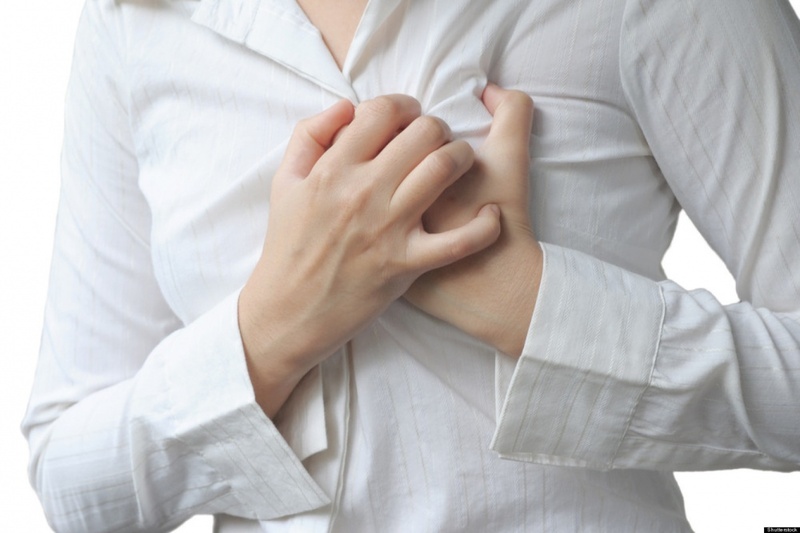 Women need to know all the potential symptoms of a heart attack, and demand help immediately if these symptoms do hit. Debra, age 42, USA: “I was under a lot of stress the week I had my heart attack. My first symptom was an odd squeezing sensation in my chest, as if someone reached out and grabbed my heart and squeezed it a few times. No pain – it really didn’t hurt. After my chest sensations went away, my upper back between my shoulder blades started to ache immensely. Diane, USA, heart attack at age 33: “My first heart attack was 23 years ago, but I remember it as though it were yesterday. I had just turned 33 the month before it happened. I put my 3-month old baby to sleep in her crib, checked on my older daughter and went to the living room to relax before heading to bed myself. My first symptom was like a fist in the center of my chest, pushing and squeezing to get out. The pain felt as though someone was gripping me inside right in the center of the sternum and squeezing until I could hardly breathe. My left arm hurt from the shoulder to the elbow, then stopped and picked up hurting at my wrist into my hand. I started feeling very sick to my stomach and vomited until there was nothing left, but still continued retching. I was sweating like crazy. I woke up my husband, and told him I thought I was having a heart attack, but not really believing that was happening because I had no clue what the symptoms of a heart attack were. While waiting for the ambulance, I went from abnormal sweating to freezing cold. In hospital, they diagnosed a 98% blockage of the LAD, which they did angioplasty for. I spent 15 days in the hospital. I had just given birth three months prior, but even during the pregnancy and afterwards, I had been getting that same feeling in my chest off and on. I had mentioned it to the ob/gyn, but they told me that I had so much amniotic fluid that it was pushing my insides up into my chest and that was the cause of the feeling. Monica, USA, heart attack at age 32: “One month prior to my heart attack, I was not feeling well with chest pains, lock jaw and fatigue. But my first real symptom was at 5 a.m. – pain in mid-chest radiating into my back and into my throat. I felt like I was being strangled, pain spreading into my throat and ears. The pain literally felt like 10,000 elephants sitting on my chest. In the ER, because of my young age and the fact that I weighed only 100 pounds soaking wet, they thought I was a drug user. I was later told I’d had a massive heart attack. I spent two days being stabilized before having a stent implanted, but instead of the stent, I was taken straight in for emergency bypass surgery. My heart now has severe damage to the left lower chamber. Last spring, 10 years after my heart attack, I had to go back into the hospital to have an implantable cardiac defibrillator (ICD) put into my chest. I have named my ICD “Trigger”! Allie, age 51, USA: “I’ve had two serious cardiac events with different symptoms for each one, so I’ll tell you both stories. My first symptom in January was incredible fatigue. I was sitting in bed, watching TV and could suddenly no longer even hold my head up. The next day began six weeks of on-and-off symptoms of nausea, dizziness, back pain in my left shoulder blade (which eventually began to radiate through to my chest), profuse night sweats and feelings of being intolerably hot. I began having panic attacks (my first ever), feelings of doom and severe anxiety. The back pain felt like a muscle knot. After a while, it seemed to hurt all the way through my body to my chest with that same soreness and knot feeling. My symptoms were not related to exertion. When I went to the hospital, I had to have emergency open heart surgery for a triple bypass. Nancy, age 44, USA: “I believe I had SCAD (Spontaneous Coronary Artery Dissection) 10 years ago, but was misdiagnosed with costochondritis, 11 days postpartum. Two years ago on a Sunday afternoon, I had a strange spell of nausea, headache and faintness out of the blue – a combination of sick feelings that lasted a few minutes, and which struck me as unusual. I lay down and felt better. That was the day before more heart attack symptoms started after some heavy exertion, again due to SCAD. I think the artery must have torn a bit that Sunday, but it was not yet severe. The next morning (my theory) the tear extended after physically demanding exertion, then I had the heart attack.I think this is important to clarify because one could conceivably prevent the dangerous extension of an arterial tear by avoiding exertion (if you’ve had the prior symptom of unusual faintness/nausea). Get medically checked out if you have that unsettling out-of-the-blue nausea/faintness feeling. Do not engage in physical exertion until cleared that your heart is ok. I went to the hospital with very painful central chest pressure, labored breathing, pain/numbness radiating to throat and arm, difficulty standing or talking. In the ER, my blood tests showed elevated troponin cardiac enzymes (confirming heart attack, which the ER doc initially diagnosed as anxiety). I was taken to another hospital where the dissection was discovered and I received two stents. Two days later, two more stents were implanted for an intractable spasm of the left anterior descending coronary artery (LAD). The pressure and pain from the LAD spasm felt more life-threatening than my dissection, maybe because it was a bigger artery? Corby, age 51, USA: “My first cardiac symptom was anxiety and pressure in the upper chest – I tried to dismiss it as indigestion. (I also ignored the pain in the back – even months before, generally when I was feeling stressed). I had swelling in the hands and feet, was out of breath climbing stairs – I thought it was just the cold air. These came and went. Then I had a squeezing feeling, pressure in the center of the chest and towards the left but still felt like severe indigestion. My head and arms broke out into a cold sweat and felt clammy. I had nausea and the ‘dry heaves’. I was driving myself to work and decided to pull into the ER on the way. I had emergency bypass surgery for a blockage in my left anterior descending coronary artery (LAD) with a mammary artery graft. Carolyn Thomas is a heart attack survivor who blogs at Heart Sisters. < Previous post Adding tiotropium (Spiriva) to an inhaled steroid a mistake?